The Girls' Golf team finished the season as state runner up. Individually, Caroline and Annabel Frist finished tied for fourth place. Congratulations to Head Coach Virgil Herring, Assistant Coach Pat Sellers, and all the Tigers on a great season. At the end of day one, the Girls' Golf team was in second place and trailed the leaders by 3 shots. The travel team consisted of Olivia Cardwell, Annabel Frist, Caroline Frist, and Marshall Wilt. The team will tee off Tuesday morning to compete in the second round. The Tigers finished second at the Region Tournament to qualify for the TSSAA Golf State Tournament. 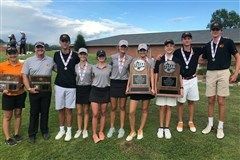 The Golf State Tournament will be played Monday, October 1, 2018 and Tuesday October 2, 2018 at Willowbrook Golf Course in Manchester, TN. Virgil Herring joined Ensworth in 2017 as the Head Coach of the High School Varsity Golf team. Herring received his degree in Professional Golf Management and Marketing from Mississippi State University and qualified as a Golf Professional in 1994. Herring has an extensive background in golf instruction, with more than 19 years of experience and over 32,000 lessons taught. He is a Charter Member Golf Channel Academy Lead Instructor and a two-time recipient of the Tennessee PGA Section Teacher of the Year. Herring has taught two PGA tour winners, two Web.com Tour winners, and more than 154 junior golfers who have earned college golf scholarships.